My family is afraid of vinegar. I know, how can you be afraid of vinegar? I didn’t believe it either, but it is true. As soon as I take a bottle of vinegar out of the pantry, my family runs for the hills. I am the only one that likes salad dressing (aside from my youngest, but she will only eat ranch dressing), and when I have to cook with vinegar, it is mandatory to open all the windows – even if it is cold and raining outside (oh, have I mentioned that we have only had 72 minutes over 75 degrees this year? ), the windows need to be wide open for the smell to escape. I have learned over the years that it is best to cook with vinegar when I am the only one in the house – and since that almost never happens, my vinegar bottles remain very full in the pantry – longing for me to find discrete ways to use them. Because of the issue with vinegar, pasta salads are not very popular in our house. I love them, and look for them every day in the salad bar at work – and for that matter, I cover my salad with balsamic vinegar every day. I saw this recipe in Cooking Light – and what caught my eye was the fact that it was missing a key ingredient – yes, vinegar! I had to give it a try, I had nothing to lose – and I was able to keep the windows shut. So, here was the funny part – it actually wasn’t that good the first night I served it. The dressing was too strong, and the orzo and veges needed more time to marinate. The next day though, it was awesome. I had no intention of blogging about this, until I had the leftovers. The flavors really came together in perfect harmony, music to my mouth. So – give this one a try, but you must make it ahead of time and let it sit – it is definitely a pasta salad well worth the wait. Cook orzo pasta with 1 tablespoon kosher salt according to the package directions, omitting additional fat. Drain and rinse with cold water. Drain well. Combine lemon juice and next 3 ingredients (through pepper) in a large bowl; stir well with a whisk. Add orzo, fennel, and the next 4 ingredients (through 1/2 teaspoon salt); toss well to coat. Cover and chill. Top with nuts before serving. That is too funny…It’s the way my kids and mother-in-law are with peppers. Any kind of peppers and they’re running as far as they can from the kitchen. I’m with you though – I love vinegar. Especially balsamic. 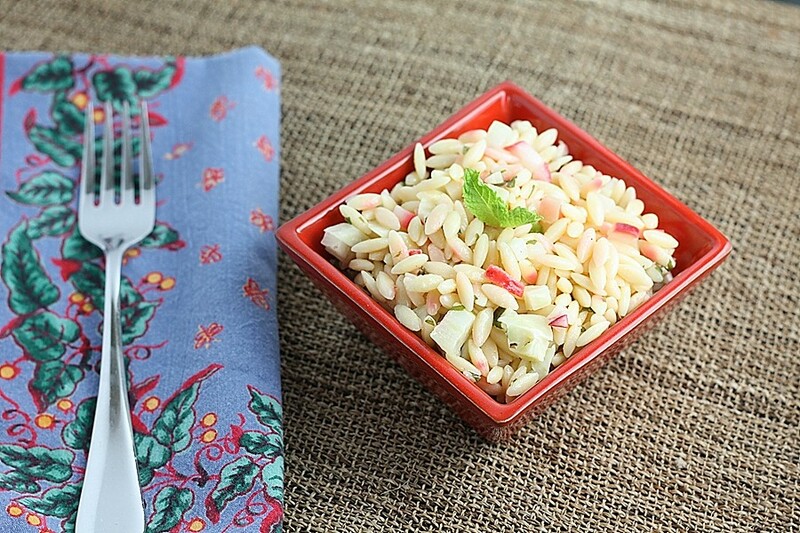 I’ll have to give this salad a try though…and I do like radishes, I just never have ideas of what to do with them. This will work well! And I can’t believe it hasn’t gone above 75! It’s been sweltering in the Midwest and even out East we’ve been in the 90’s! Crazy weather! Gotta agree with your family – vinegar is evil ! (LOL) So I thought this was a recipe I might want to try but alas, mustard has vinegar in it! But the rest of it sounds good. Funny, my family is just the opposite! They can’t get enough of dishes with vinegar. This salad sounds delicious. I love fennel and radishes so will try it. We love vinegar in our house. My oldest son will pour it onto his plate to dip fries in! Healthier than ketchup. I probably have 12 kinds of vinegar. Radishes are undervalued too…too strong to eat whole in a veggie tray, but yummy when sliced and combined with other ingredients. Dawn, How do you get the “printer friendly recipe” link? I have a blog too, and I cannot figure that out.